Designed by Captain J.H. Merryman, USRM as a smaller, lighter-weight version of the standard model pulling/sailing lifeboat used by the Royal National Lifeboat Institution. Self-righting and self-bailing. Dimensions (vary slightly by builder): 26ft. 8in. overall length, 7ft. 3.5in. extreme beam, 3ft. 8in. depth amidships from underside of iron keel to upper edge of gunwale; weight 3343lbs. 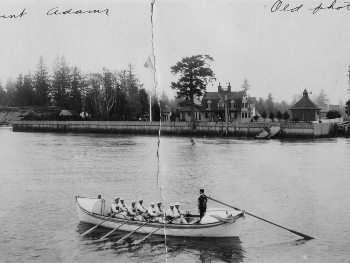 loaded; 4 thwarts for 8 ash oars rowed in double-banked configuration; standing lug or sprit sailing rig; double-diagonal planked wood hull of mahogany or cedar planking over white oak frames, copper fastened. Designed in 1878 by David P. Dobbins, superintendent of the USLSS’s 9th District of Lakes Erie and Ontario. Self-righting and self-bailing. Dimensions (varied somewhat by builder and intended operating station assignment): 24-32ft. overall length, 6-7.5ft. beam, 2ft. 4in. depth amidships; weight 2000lbs. for the smaller versions up to 8540lbs for the 32ft. 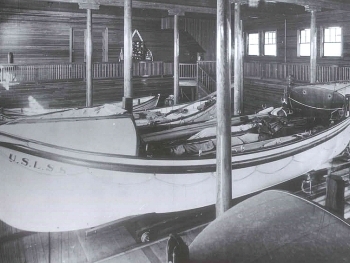 boats; 4 thwarts (5 total) for eight oars rowed in double-banked configuration; carvel-built hull of pine or cedar planking over oak frames, copper fastened. Later, enlarged version of the earlier 26ft. Merryman type lifeboat. Self-righting and self-bailing. Dimensions: 34ft. 0in. overall length, 8ft. 0in. maximum beam, 3ft. 6in. depth of hold; 5 thwarts for 10 oars rowed in double-banked configuration; sailing rig of two-masts with jib, sprit foresail, and mainsail; displacement 4tons; double-diagonal planked wood hull of mahogany planks over oak frames.